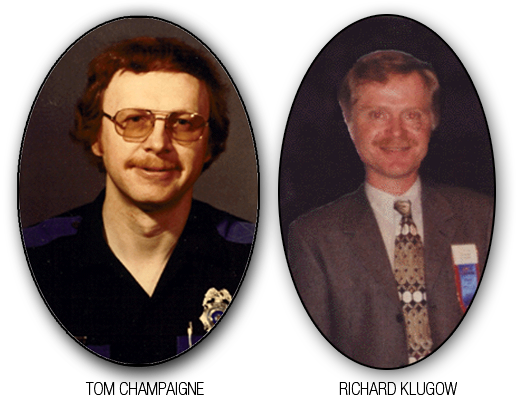 On April 29, 1990, Officer Rick Klugow and three other officers were dispatched to a call in central Superior. They were told a man was walking around claiming to be “cop hunting.” Officer Klugow spotted the suspect and called for Sergeant Tom Champaigne. Having seen the suspect wielding a knife, it was decided that they would enter the home the suspect had gone into and arrest him. The officers knocked on the suspect’s door. Suddenly the door burst open and the suspect was facing them holding a butcher’s knife. Efforts to get the suspect to surrender the weapon failed and the man charged the officers. During the struggle, officers Champaigne and Klugow were both stabbed several times. The man was eventually subdued by the five police officers and arrested. The butcher’s knife was left imbedded in Officer Champaigne’s leg. During the struggle, the officers fought for their lives. While there were five officers involved, two were forced to accept severe and painful injuries so that the others would not, and most likely saved lives, including the life of the suspect. The suspect was arrested, but the damage had been done. The injury ultimately ended the career of one of the finest community conscious officers the City of Superior has ever known. Sergeant Champaigne left a legacy to generations of children through his work in the Police Liaison Bureau. Officer Klugow’s physical injuries mended well enough to be able to return to work. He has since been appointed to a number of special duties, including detective, ballistics officer, and eventually Sergeant. Those who know Rick know him as someone who never quits, and welcomes a challenge with tremendous desire. 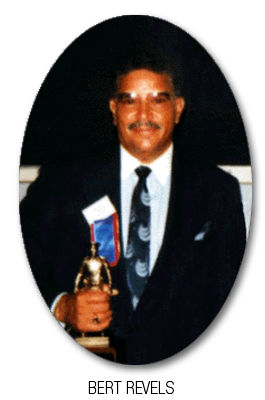 Bert Revels started as a patrolman with the Milwaukee Police Department on November 30, 1959. While on patrol on Christmas evening, 1965, Officer Revels observed a man standing on the steps of a local tavern. The man held a threatening shotgun in his hands. Officer Revels reacted by drawing his service revolver and ordering the man to drop his weapon. Instead of surrendering, the man opened fire and shot Officer Revels, 42 shotgun pellets penetrating his body. Officer Revels lay wounded in the street as the menacing gunman approached him. Although being in position to return fire on the gunman, Officer Revels held back due to several spectators being in the line of fire. When all of the innocent citizens were safely out of the way, Officer Revels returned fire and fatally wounded the gunman. Witnesses to the incident said that Officer Revels saved countless lives while he lay bleeding in the street, refusing to shoot, while people were in harms way that Christmas night. Sergeant Bert Revels recently retired from the Madison Police Department at the age of 61.